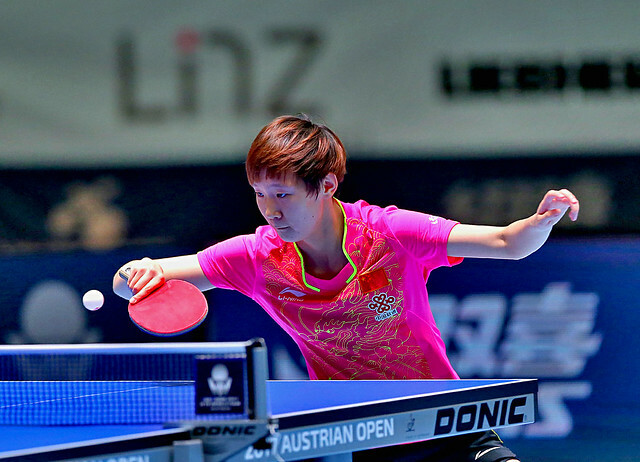 Runner up in the Girls’ Singles event at the 2015 World Junior Championships in the French west coast town of La Roche sur Yon, China’s Wang Yidi was the player to cause the biggest upset as proceedings commenced in the Women’s Singles event at the Seamaster 2017 ITTF World Tour Platinum, Hybiome Austrian Open in Linz on Thursday 21st September. The now 20 year old accounted for Japan’s Kasumi Ishikawa, the no.3 seed. Impressively, Wang Yidi emerged successful in five games (11-9, 12-10, 9-11, 11-9, 11-6); her fast attacking skills proving the winning formula. Success for Wang Yidi against expectations somewhat overshadowed the efforts of colleagues Chen Xingtong and Zhang Rui; both required to compete in the qualification tournament, both caused upsets. Moreover both added to Japanese chagrin. Chen Xingtong, winner earlier this year on the ITTF World Tour in Hungary, beat Sakura Mori, the no.11 seed (11-8, 11-3, 13-11, 11-2); Zhang Rui fresh from her success of one day earlier when she won the Under 21 Women’s Singles title, accounted for Miyu Kato, the no.12 seed (11-7, 7-11, 11-8, 5-11, 11-9, 6-11, 11-2). Success for three Chinese plays against the odds; as play commenced in the opening round of the Women’s Singles event in Linz, there were three successes as predicted. Chen Meng and Sun Yingsha both added to Japanese pain; Chen Meng, the top seed, beat Miyu Maeda (9-11, 11-7, 11-4, 8-11, 11-5, 11-5), Sun Yingsha, the no.4 seed, overcame Saki Shibata (11-4, 11-6, 9-11, 11-3, 11-8). Impressive performances; not to be left out, Wang Manyu, the no.6 seed, ended the hopes of Hong Kong’s Minnie Soo Wai Yam (11-4, 11-13, 11-6, 11-6, 11-5). Disappointment for Hong Kong but there was success; Lee Ho Ching, the no.15 seed, beat Miyu Nagasaki (13-11, 10-12, 11-7, 9-11, 11-9, 11-3) to add to the woes of Japan. In the opening eight matches, seven involved players from Japan, all seven suffered defeat. Play in the first round of the Women’s Singles event continues later in the day.